To date, taking a TV show with you to watch on a laptop or portable media device has meant downloading it (e.g. from iTunes) or else recording it using a TV card or capturing it from a set-top box on a computer and converting it to suit. 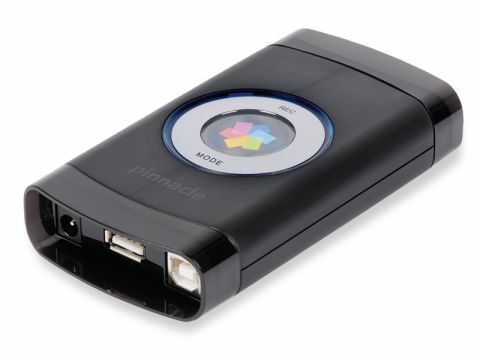 Pinnacle's handheld digitiser eliminates the need for a computer by capturing video directly from your receiver (or a DVD or VCR player) and transferring it to a storage device (ﬂash stick or external hard drive), iPod or Sony PSP. It's one-and-a-half times the size of an iPod Classic with connectors at either end. A power supply and male and female USB 2.0 ports are at one end and S-video, composite and phono jacks at the other. The included Scart to composite/ phono connector attaches to the Scart output of your receiver for capture. Plug the intended storage device into the Transfer USB and you're ready to start recording. The Transfer makes good use of LED indicators and simple dual button (there's only REC and MODE) controls. Repeatedly pressing MODE selects from three quality settings - Good, Better and Best - indicated by three blue LEDs. Press REC and the device lights up red. Press REC again and the recording stops while the LEDs blink brieﬂ y to indicate that the recording is being ﬁnalised. There's no timer option; this is recording 'on the ﬂy' - Sky+ users can use the receiver's Copy function for archiving to the Transfer. Recordings are made in H.264 and ﬁle sizes and resolutions vary between settings. Good and Better are locked at 320 x 240 (with slightly better audio and video sampling for the latter). In Best Mode if you're recording directly to an iPod 640 x 480 is the maximum or interlaced 720 x 576 (PAL) if to a storage device. Recordings made to a PSP are locked at 320 x 240. In all cases the Transfer insists on adding black borders, top and bottom, to recordings. Flash stick recordings of Sky shows looked predictably soft on the two lower-quality settings, but audio and picture was passable on our iPod's 2.5in screen. While still looking a little over-compressed on our laptop, the Better setting isn't far of the picture and sound quality of the original recording - especially when using the S-video connection. The story is the same with recordings made directly to an iPod but those building a library of recordings must rename the ﬁles something other than 'Pinnacle video 0001' using iTunes. It's pricey, but the Pinnacle Video Transfer will recoup its value (especially if you're a Sky subscriber) compared with paying close to £2 for shows on iTunes.